Pink Owl Inspiration: A Valentine Freebie! I'd thought I'd share a little freebie I made today! 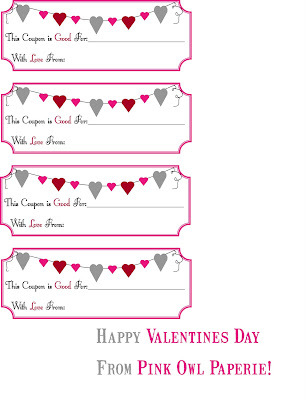 Here are some printable love coupons you can use for Valentines day! They'd be super cute bound into a little book and given to your sweetie, a friend, or family member! They'd also make cute embellishments for scrapbook pages and cards! Simply click to enlarge and save to your computer. Then print away for some Valentines fun! Happy Valentines Day! Welcome to the Pink Owl! Hey! I'm so glad you stopped by! Come on in, grab a cup of coffee, and take a look around. I hope this little blog inspires you !